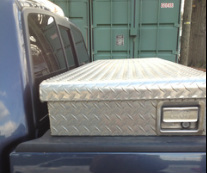 Truck bed tool/cargo boxes are excellent accessories to help keep your cargo organized and secure. However, the conventional tool box mounted behind the cab may not be the best solution for everyone. That is why we developed the AeroBox. Read below to see why an AeroBox may be the better solution for you. The AeroBox mounts at the rear of the truck bed with the door facing you, not the sky. This makes accessing your cargo very easy at the tailgate opening, without the strain of over reaching or climbing in to the back of the truck. Slide heavy items in/out, versus lifting up and over the edge of the box. The AeroBox can be easily undocked from its patented dock-n-lock side panels and wheeled away to the jobsite, campsite, activity field, or just back to the garage. Save yourself multiple trips and constant packing and unpacking your stuff! Sometimes you need your entire truck bed cargo capacity. In these situations, the AeroBox can be easily removed and stored in the garage, giving you more room for more stuff! The AeroBox sits down in the bed below rail level, hidden from view, preserving the style of your truck and hidden from prying eyes. This low profile allows the AeroBox to be used with many tonneau covers and other truck bed accessories (please confirm fit before buying). Computer models have shown the AeroBox to reduce aerodynamic drag on your truck by 4.5%, which is similar to a tonneau cover. That means better fuel economy. When not carrying a load, most of the weight of a truck is in the front, but the drive wheels are typically in the rear, making them more susceptible to fishtailing on slick roads. Placing the box and its contents at the back of the truck places more weight over the rear wheels, yielding more traction. Cargo/Tool boxes mounted at the cab must be accessed at the sides of the truck, ofttimes requiring a step assist, or by climbing up in to the truck bed to reach some of your things. Not so easy for shorter people, or as we become "less nimble"! Most truck tool boxes are not meant to be removed, once installed, so your cargo stays with your truck or must be removed item-by-item. Bright, shiny, and highly visible boxes advertise you've got valuables stored in your truck bed . . . an invitation for thieves! Typical tool boxes are 18" to 24" deep and as above, very difficult to remove. For a 6 foot bed, that takes up 1/3 of your space! The space under the box is fairly unusable and usually just collects the garbage you can't reach. Most tool boxes extend well above the rails, changing the look of your truck and making them highly visible to thieves. They also limit your options for tonneau covers, rail bars, racks, etc., and can inhibit rear window visibility, which can be a safety concern. The higher profile of a conventional tool box mounted behind the cab can have a minor negative affect on the trucks overall aerodynamics. Since the added weight of the box and its contents are closer to the front, it does not improve the overall weight distribution or traction, but the added weight may increase the stopping distance and decrease fuel economy.